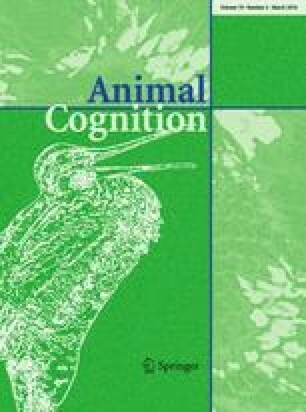 This study demonstrates long-term declarative memory of imitative actions in a non-human animal species. We tested 12 pet dogs for their ability to imitate human actions after retention intervals ranging from 1 to 24 h. For comparison, another 12 dogs were tested for the same actions without delay between demonstration and recall. Our test consisted of a modified version of the Do as I Do paradigm, combined with the two-action procedure to control for non-imitative processes. Imitative performance of dogs remained consistently high independent of increasing retention intervals, supporting the idea that dogs are able to retain mental representations of human actions for an extended period of time. The ability to imitate after such delays supports the use of long-term declarative memory. This study was supported by the Hungarian Scholarship Board by providing a fellowship to C. Fugazza. A. Miklósi also received funding from MTA-ELTE Comparative Ethology Group (MTA01 031) and the Hungarian Science Foundation (OTKA K81953 and K109337). We are immensely grateful to the dog-owners who participated in this research with their dogs. The authors confirm that the experiments reported in this paper are in accordance with the current Hungarian laws in regard to animal protection. The authors declare that there is no conflict of interest with their sponsors.